You’re from Miami, Florida. What is your favorite thing about your hometown? I really loved the sense of community in my Abuela’s old neighborhood--I have very fond memories of gathering with the other neighborhood kids in my Abuela’s cul-de-sac and playing outside all day until sundown. I’m very thankful I was able to get exposure to the strong Cuban-American culture in Miami from a very young age. While the city continues to develop and grow, it’s comforting for me to know that I can still drive down to Sergio’s on Coral Way and pick up a cafecito and croquetas, just like I would when I was younger. What made you decide to get involved in politics? I actually fell into politics randomly. I had always been involved in Student Government in middle school and high school, but never figured I would pursue politics as a potential career path. Initially, I wanted to be a journalist when I went to college---and I didn’t want to cover politics, I wanted to cover fashion. During a particular rough patch my sophomore year of college, a friend of mine who was a field organizer for President Obama’s re-election campaign in 2012 reached out to me about volunteering on the campaign. As they say, the rest is history. I loved the high-stakes thrill of working on campaigns, and more importantly loved meeting new people and hearing about what issues mattered to them the most. Everyone knows you are a huge “Hamilton” fan. What is your favorite song from the soundtrack? Everyone knows you are obsessed with podcasts, namely Crooked Media podcasts. Who is your favorite Pod Save America team member? Well, this question is easy--it’s a dead three-way tie between Lucca, Leo, and Pundit. Although you’re still enrolled in school at FIU, you attended school in Pittsburgh initially for three years. Where was your favorite place to go to in Pittsburgh? Even though I have no intention of moving back, Pittsburgh will always hold a very special place in my heart. Some of my favorite go-to spots when I was living up there were Schenley Park/Panther Hollow Trail for a run; PNC Park to catch a Pirates game; William Penn Tavern for kitchen sink wings; or Lawrenceville in general. One of my favorite things about Pittsburgh is that there are incredible things to explore in every corner of the city, if you give yourself time to do it. It is a magical city, and it’s hard not to fall in love when you first take a glance at that skyline from PNC Park or Mount Washington. In your opinion, where can one find the best old fashioned in Palm Beach County? At 215 speakeasy, made by Vincent, 123 Datura, or at Park Tavern! What is the strangest/funniest way you’ve been asked out on a date? So I actually have two funny/weird stories to share. The first, a guy once asked me out on a date by throwing a napkin at me from across a bar. I looked over angrily at him, and he made a gesture as though he wanted me to open up the napkin. I did--on the napkin he wrote, “Lick your elbow if you are not interested in going on a date with me. Smile if you are.” It was a little aggressive, but creative, I guess. The second, I was at a fraternity event and one of the brothers tried to ask me out by singing “Call Me Maybe” by Carly Rae Jepsen to me. This was about two weeks after the song first came out, and I hadn’t heard it yet. I thought he was singing a song off of a Kidz Bop album. I had no choice but to run away as quickly as possible. I love all types--Cuban, French, Italian, Japanese, and Mexican are some of my favorites. If you could have one food from said cuisine for the rest of your life, what would it be? Since I listed a lot of cuisines, I’ll just list two items--Cuban coffee and gnocchi. Where is your favorite stop for Cuban coffee in Palm Beach County? Delicias Cuban Bakery! Guys, it’s the most unassuming place because it’s quite literally inside of a gas station, but trust me—they have the BEST cafe con leche and croquetas. For a car ride jam out session with friends, what are five of your go-to songs? “Hey Ya!” by Outkast, “September” by Earth Wind and Fire, “Africa” by Toto, “Feeling This” by Blink-182, and “All These Things That I’ve Done” by The Killers. “Mon coeur s’ouvre a ta voix”--my heart opens to the sound of your voice-- from “I Belong to You” by Muse. Any YDs know that both yourself and VP Alex are big Taylor Swift fans. What Taylor Swift music video is your favorite? “Blank Space”, of course! I’ve actually been to the mansion where the music video was filmed. I also loved the “Delicate” music video. Parks and Recreation or The Office. Also a huge Game of Thrones and Westworld fan. What is your favorite quote from said TV show? Which character do you think you’re most like on that TV show? Somewhere between Leslie and Ann from Parks and Recreation. I can be very high strung and Type A, but definitely do not have as much energy as Leslie does. I have an ever-changing top 10 list, but Almost Famous always tends to stay at the top of that list. The “Tiny Dancer” bus scene from Almost Famous, and the Griffith Observatory scene from La La Land. What is your favorite movie franchise? I’m a huge Harry Potter and Star Wars nerd! I’ve also really started getting into the Marvel movies. Everyone knows hiking is one of your hobbies--where would your dream hike be? This is probably not the first location people think of when it comes to hiking, but I would love an opportunity someday to hike in the Swat Valley region of Pakistan. Hiking in the Alps in Northern Italy is also on my list. In addition, I would like to complete at least one hike in every U.S. national park. I recently went to Grand Teton and Yellowstone National Parks, and I think the next parks I want to hit are Yosemite, Zion, Bryce Canyon, Capitol Reef, Glacier, Crater Lake, and Olympic. We also know you’re a big runner and have completed three half marathons. What race would you consider to be your dream race (5k, 10k, half, full)? I definitely would like to do a half marathon in a US national park. I also would like to run the New York City Half Marathon, the Broad Street Run in Philadelphia, and both the Pittsburgh and Philadelphia Half Marathons. Eventually, I’d like to work up to being able to run a full marathon--but I’m still a few years away from hitting that goal. Who is someone that inspires you in local politics and why? My boss, of course--Michelle McGovern! She is so full of passion and energy and loves what she does. She is amazing at supporting and helping out those that she loves. I’ve never seen someone quite go out of her way for others like Michelle does. She’s not only my boss, but she’s THE boss. She is great at what she does because she puts so much passion and love forth towards her job, her family, her friends--everything! Where can we find you hanging out on the weekends? Probably on a running trail somewhere, at the gym, a bookstore, or at a coffee shop studying--I’m still in school, so weekends are usually my homework/study time. I also like to take little weekend trips to different cities around FL sometimes or to cool hiking spots out of state. I throw way too many pop culture references/movie and TV quotes into everyday conversation. Gabe from The Office would hate me. (Oh, look, another pop culture reference.) I also put an insane amount of hot sauce on all of my food. If you ever ask to split a dish with me, I’m sorry—it’s probably going to get drowned in Cholula or Sriracha. Which sports teams do you support? Where is your favorite place that you’ve traveled to? I was lucky enough to be taken on a trip to France by my aunt and uncle when I was fifteen. I’ve been completely enchanted with Paris ever since. There is also something so stunningly magical about the American West. I completely fell in love with Montana and Wyoming this past summer, and have always adored traveling to Colorado and Arizona. I also had an amazing experience in Guatemala and Lake Atitlan. Everywhere? Seriously though, some of my top destinations include South Africa, Morocco, Slovenia, India, Singapore, New Zealand, Chile, Japan, Italy, Croatia, and Scotland. I also hope to hit every major U.S. national park in my lifetime and attend a game at every MLB stadium in the country. Which fictional place do you wish you could travel to? Despite the fact that Pottermore has repeatedly sorted me into Gryffindor, I am adamant that I am a Ravenclaw at heart. ….I also realize that my stubbornness may be why I was sorted into Gryffindor. What issues are you passionate about in our current political climate? Gender equality, U.S./Cuba relations, finding political and economic opportunities for women to thrive worldwide, and ending sexual violence. Construct your perfect meal, using only dishes from Palm Beach County restaurants. The gnocchi appetizer from City Cellar, pierogies from The Butcher Shop, the Cajun burger from the Seafood Bar at the Breakers or the spicy burger from The Brass Ring, buffalo garlic wings from the Brass Ring, mac and cheese (with lots of hot sauce!) from Howley’s, and the skillet cookie dessert from HMF at the Breakers. Who is someone (dead or alive) you would love to sit down to dinner with, and where would you choose to go to dinner with that person? Amal Clooney. I truly respect her and actually wanted to go to law school to practice international law for a little while. I appreciate all the work she is doing for the Yazidi people with her client, Nadia Murad, and for working to release Khadija Ismayilova and call out free speech/human rights violations in Azerbaijan. She seems like such a fascinating and remarkable woman, and I would love to hear some of her stories of her travels and various cases she’s worked on. I hopefully see myself living in D.C., Philadelphia, or New York City, either working for a nonprofit, in public affairs, or in foreign policy for the State Department/United Nations, while traveling a lot. Do you ever want to run for office? I get asked this a lot, and my inclination is to say no. I’m a pretty introverted person, and I like working behind the scenes more on the policy side. I also don’t think that I should make “running for office” a general goal just because I work in politics. I want to encourage and bolster people to run for office who come from different backgrounds who may have not have thought about public service otherwise, on top of encouraging my incredible friends who do work in politics to run! What is the most important life lesson you’ve learned at 25? Do not beg people to support or love you. I’ve been in too many situations in the past where I’ve tried to make things work with other people, jamming two puzzle pieces that don’t fit together out of sheer stubbornness or due to the fact that I didn’t have enough knowledge of my self-worth to walk away from situations that were toxic or not beneficial to me. I still struggle with it sometimes, but you should never waste your time and energy on people who won’t help and support you, and at the very least don’t see your potential. To get to further know your ~casual and fun~ PBCYD board members, we are introducing a new feature here on the YD Review called "Beyond the Bio." We will be interviewing each of our six board members with interview questions curtailed to their personality/interests so you can get to know who they are beyond their official bio. First up: resident powerhouse and Madam Vice President, Alexandria Ayala! 1) You were born in Puerto Rico. What is your favorite memory of your childhood in Puerto Rico? Our family’s property is in Sabana Grande, PR up in the mountains. Our house is just under my grandparent’s. I spent such a happy childhood growing up being so close to them- helping my grandpa with the roosters, with the avocado trees or just swimming in their pool. That cherished abuela y abuelo time are some of my favorite memories. 2. How do you feel about the Trump Administration’s response to Puerto Rico after Hurricane Maria? What do you think needs to be improved on? Ummm….could definitely have been handled better. I’m personally not a fan of the paper towel toss...I think blame lies more on the longstanding dysfunctional relationship between PR and the US than any one individual though and those implications are political, social, economic, etc. However, given that there were natural disasters in both Texas and Florida and the situations were handled wildly differently, I question efficiency. I think it’s a much deeper problem than one singular issue but a step in the right direction would be discussing a more equal division of resources from federal agencies to Puerto Rico. For example, Puerto Rico's Medicare reimbursement rates for doctors are roughly 40 percent lower than states in the US. There are urgent issues that need bipartisan conversations and solutions. 3. You moved to the United States when you were 7. Tell us something you love about your US hometown, Palm Springs. I love the diversity of Palm Springs, kind people from countries all over the Caribbean and South/Central America live here so it’s common to hear 5 different languages spoken on any given corner. Also, being 10 minutes from the beach never hurts! 4. What made you decide to get involved politically? I very happily ended up in politics and public service after I went to college thinking I’d become a nurse and quickly realized I didn’t quite have that skill set! I was in my 2nd year at University of Central Florida during the 2012 presidential election when I was seeking a major change. That election particularly interested me because 2008 had already been such an important, pivotal moment in history and 2012 felt like a moment where we’d either continue progress or change course completely. At the time, the University of Central Florida College Democrats were super active on campus by registering voters, hosting rallies with guests such as President Bill Clinton and Governor/Congressman Charlie Crist, bussing students to the polls. That service and activism spoke to me. I always wanted to help people and this way my way to do that. Best decision I made yet and I truly love what I do. 5. If you could have dinner with one politician, living or deceased, who would it be and why? Definitely President Obama and Michelle. That’s two but I think it’s a fair request. As stated above, his 2012 campaign and inspiring message were the catalyst for my own political involvement and the way he inspired people in this country to get involved captivates me. 6. You attended college at UCF. What is your favorite memory of being a UCF student? I absolutely love being a UCF Knight. Best experience of my life! Favorite memory has to be traveling to Arizona with the UCF Marching Knights and the football team for the 2014 Tostitos Fiesta Bowl. Which we won!! 7. What was your favorite on or off campus hang out spot at UCF during your college years? 8. What is your favorite alcoholic beverage? Tequila anything. The watermelon jalapeno margarita from El Camino is heavenly. 9. Red or white wine? 10. What is the strangest and/or funniest way you’ve been asked out on a date? 11. What is your favorite cuisine? 12. What is your favorite food item from said cuisine? 13. If you could eat one thing for the rest of your life, what would it be? 14. What is your favorite music genre? 15. Best concert you’ve ever attended? 16. Anyone involved with the PBCYDs knows you’re a huge Taylor Swift fan. What is your favorite Taylor Swift song and why? Blank Space. So funny, relatable and clever. I love the practice of owning the criticism thrown at you and being in charge of creating your own narrative. 17. Favorite Taylor Swift music video? 18. What is your favorite TV show? 19. What is your favorite quote from said TV show? 20. Who is your favorite character on that TV show? 21. What character do you think you’re most like on that show? 22. If you had to compare President Trump to a TV show character, who would it be? 24. What is your favorite scene from a movie? Hmmm...a Tarantino moment for sure. Hard to pick between the Django dinner scene or the Inglorious forest baseball bat scene. 25. What is your favorite movie franchise? 26. Where is your favorite place to go out to eat in Palm Beach County? Ugh this is too tough. I’m a giant foodie who loves trying new things and there are so many amazing places opening up every day in PBC. 27. We know that you love a good acai bowl. Where is your favorite place to grab one in Palm Beach County? 28. Where is your favorite place to hangout in the county that’s not at home? Various coffee shops. Common Grounds, SEED, Subculture WPB/Delray, Johan’s. 29. What is your go-to Subculture Coffee order? 32. Who is someone that inspires you in local politics and why? Commissioner/State Rep. Dave Kerner. He’s accomplished so much so young, always stood by his principles and been able to work with multiple groups to get good things done for his constituents. Also, he’s always extremely approachable and encouraging of young people in politics. 33. Where can we find you hanging out on the weekends? The streets of PBC, registering people to vote! 34. Where is your favorite place that you’ve traveled to? I haven’t traveled nearly as much as I hope to yet. 35. Where would you like to travel to in the future? 36. What fictional place do you wish you could travel to? 37. What issues are you passionate about in our current political climate? 38. Do you want to run for office someday? 39. What do you see yourself doing in five years? The beauty of this career is that it’s full of ever changing opportunity. I can see myself doing a variety of things. I know it will involve continuing to be the best public servant I can be and uplifting marginalized voices. 40. What is your favorite part about being a board member for the Palm Beach County Young Democrats? The opportunity to engage with the thousands of other brilliant, driven, inspiring young dems across this county and great state. It gives me hope to know such amazing people, which then fuels my path forward towards a future where government and politics are exciting, positive words and not things we stay out of! Palm Beach County hosted its municipal elections on March 13th--and in particular, Delray Beach city commission seats were hotly contested. 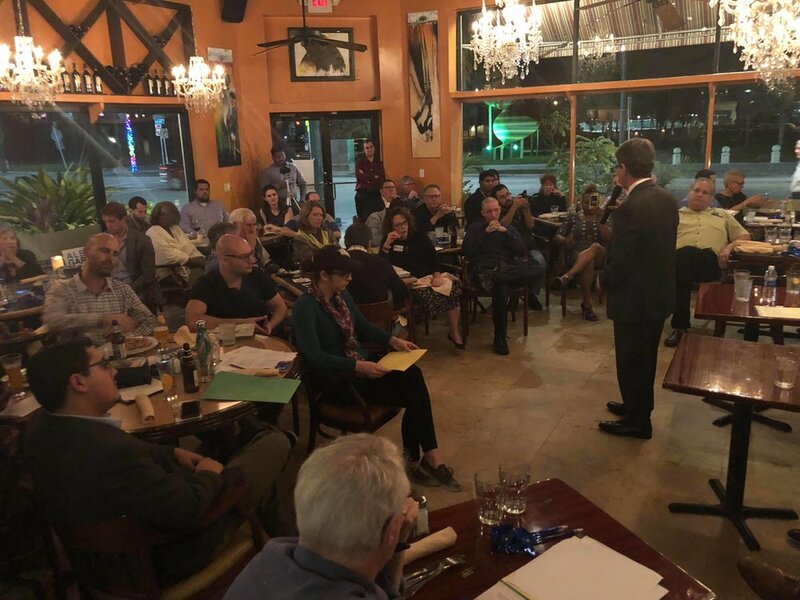 Two of the new commissioner-elects, Adam Frankel and Ryan Boylston, joined our chapter at our March monthly meeting to briefly give an overview of the type of campaigns they ran and their vision for Delray Beach going forward. Commissioner-elect Adam Frankel explained he ran a more traditional campaign; he made sure to converse with the “old guard” and elected officials. It also should be noted, however, that Commissioner-elect Frankel laid strong groundwork with canvassing and even made sure to go the extra mile by calling voters who weren’t home to check in. Additionally, Commissioner-elect Frankel previously served on the commission for 6 years. Commissioner-elect Boylston ran “the best campaign in Delray”, according to Commissioner-elect Frankel, in part because his campaign was so tuned in on social media. Frankel admitted that while they shared many of same positions on important issues, they ran two different types of campaigns. The most inspiring message of the evening, however, came from Commissioner-elect Boylston when he chose to speak candidly of his choice to stay independent of a political party affiliation for the city commission race. The atmosphere was energized at a new meeting location, beautiful Sundy House in Delray Beach. The speeches were a concrete reminder that the work we do in our local communities, politically affiliated or not, truly matters. To close out the meeting, super presenter Geoffrey Kashdan gave an in-depth look into gun regulations historically in the state of Florida. We hope many of you will be joining one of the local March for Our Lives events taking place on March 24th. Welcome to the new Palm Beach County Young Democrats blog! This blog will be a space to keep you updated on local and state politics, elected officials, as well as national issues that we believe should be brought to attention. Our 2018 year kicked off at our new meeting place in Northwood, Cafe Centro, with an exciting debate between three of the four District 2 Palm Beach County Commission candidates: Alex Garcia, Gregg Weiss, and Emmanuel Morel. (Sylvia Sharps will be speaking at our February meeting.) For those who were unable to make the lively debate, please see video for highlights. Alex Garcia is a realtor who is dedicated to creating well paying jobs for postgraduates once they return from college, lowering taxes for the middle class residents of Palm Beach County and championing growth management as Palm Beach County develops. Alex will support growth management strategies that preserve open spaces, will make traffic and congestion more manageable, and exercise the most sustainable use of our natural resources. Gregg Weiss has over 30 years of business experience overseeing sales, marketing and implementing best business strategies. He is a county activist and has been extremely involved in the West Palm Beach community. Gregg’s executive experience will give him valuable insight on managing the county budget and increasing government efficiency. He believes his history of mediation throughout his career would help bring the West Palm Beach City Commission and Palm Beach County Commission together. He also believes that by communicating and finding common ground, we can move forward in our goals as a county.